I also periodically love not running. Taking some time away from training after a cycle and before a new one is super important for me. It’s a completely necessary mental and physical health check to let the mind and body recover. A runner’s “re-boot” button. I’ve found that I have a bit of a love/hate relationship with my couple weeks of time-off of a training plan. After all, it’s kind of a shock to the body, going from what should be your peak fitness to absolute rest. Generally, my sentiments regarding the time boils down to something like the following. Resistance. What do you mean, “don’t run?” When do I shower? Do I even need to shower? How do I start my day? I JUST DON’T UNDERSTAND. Acceptance. Ok, this is actually kind of nice. Beer with lunch? Yes please. Someone isn’t doubling today. Booyah! …a little too much acceptance. Ok, I’ll have cake for breakfast. Again. Hell, why not lunch too. I’M ON VACATION, I mean, a break. Restlessness. Dear couch, we’ve had a good run of ridiculous amounts of lazy this past week or so, but it’s time that I start seeing outdoors again. My sanity needs it. Thanks for understanding. The above is a not-so-exaggerated representation of the few short weeks of time off. I’ve taken many of these breaks between seasons over the years, but they still occupy an odd period of time for me. I suppose it’s because such the vast majority of my year is spent training. By the time I’ve gotten used to the time off phase, I’m back to a schedule. I took a full 10 days off, and then spent this past week running every other day. I did have to figure out when, in fact, normal people shower. I had quite a few lunch beers. And cake (not my fault that Mother’s Day and my dad’s birthday happened to produce an abnormal amount of cake in our household). And I got restless as hell. I love the life that I live with training, but the reality is that it normally vetos certain activities, due to exhaustion and the utter limit of time (have we seriously not figured out time travel yet?? C’mon people). That all said, I try to make a point of taking advantage of my time off. This time around, I was lucky enough to get in some shenanigans at the inaugural Bottlerock music festival in Napa Valley. I drove out with a couple of friends on a Thursday, camped out for a couple nights, saw a ton of music (The Avett Brothers, The Alabama Shakes, Iron & Wine, The Black Keys, Ben Harper, to name a few…) and returned to Santa Rosa late Saturday night utterly exhausted, filthy, and happy. 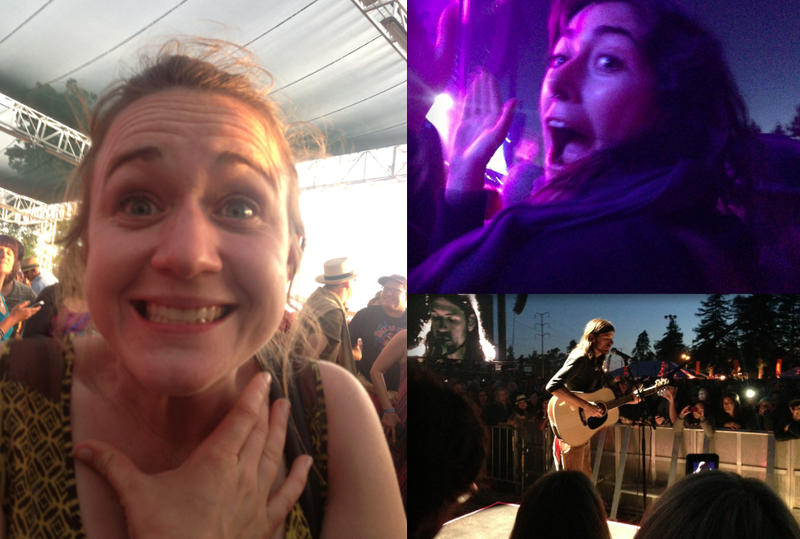 Michaela’s excited face on the left, Katrina on the top right (watch out for this one-turn your head for a second, and she legitimately may rush the stage…making her a splendid concert-going buddy), and Seth Avett on the bottom right. Friends. Music. Beer. Sun. Mission accomplished. And when the legs really started to itch for something to do, I took myself for a couple hikes in Annadel State Park. There are worse ways to spend a couple weeks. This week marks a return to my first scheduled week of running. It’s nice to see numbers with miles after them again, and makes me itch to see what the coming weeks have in store. I feel rested, and ready to get to work. A break well accomplished. Categories: In My Head | Tags: boulder, friends, healthy-living, hiking, Life, Lifestyle, mental-health, music, outdoors, running, seasons, training | Permalink. Going into my most recent cycle of training and racing, I planned on the Payton Jordan 10k being my capstone race of spring training. I was excited with the race opportunities as a whole that my coach and I had lined up leading up to this big one. The schedule looked set. I was content with it. However, after running a huge 5k PR at Stanford, and feeling workouts lock into place, the “A” standard of 33:20 for USA championships began to feel more and more within reach. I felt fit, fast, and fired up. And I wanted to nab myself a spot on the start line of that 10k in late June in Des Moines. Photo credit to the one and only Gary Towne. Overall, it was an awesome night. I was lucky enough to have the support of a good chunk of the Chico State crew, my coach, family and friends who made the drive to see me. Honestly, anyone who sticks around for a 10k that doesn’t even start until damn near 11 p.m. should get a medal. Or better yet, cookies. With chocolate in them. Anywho: to everyone who stuck around-you are really really really awesome. Within the days following Payton Jordan, I had a decision to make. I could extend my season to give the mark another crack at the Portland Track Festival in several weeks. Or I could call it. Move on. After thinking on it for several days, I decided to close the season. As much as I wanted another shot to show my fitness, when I looked at what I’ve got going on currently and in the immediate future, I feared that I would show up in Portland strung-out, tired, and not ready to tackle a fast 10k. I felt like it would be a real stretch to get myself there in the mental and physical condition that I wanted. The decision left me feeling a bit happy/sad, in awe of how quickly my own expectations and confidence as an athlete have shifted, but still sad to see the season end. This mark wasn’t even on my radar at the beginning of March, but it was still a bit difficult to see it go. I know that I have a lot of unfinished business with the 10k (and with many other distances, for that matter), which is possibly the most frustrating part about moving on from a season. No matter how big the PR is, it can become far too easy to finish a race and still feel a twinge of disappointment by the potential you possess that still has yet to come through. I’ve learned that what can feel like a conflicting dissatisfaction is part of this whole competitive lifestyle. I’m lucky to be moving forward, to be where I am, with what I have ahead of me. I am anything but done with this sport. So long as I still have that feeling, that hunger, it just means that I’m still in this. I’m excited to focus on my move, which is coming up (three weeks from yesterday)! The opportunity to settle into my new home, new surroundings, and lack of oxygen, without the stress of being race-ready is appealing as well. It feels like a good time to transition. And I’m really grateful for that. For now, I’m doing my best to take a short break from running before gearing up for the next cycle of training…which will be for a fall marathon! Getting back on the track this spring to continue developing my speed was incredible and incredibly important to keep me moving forward. However, I’m hungry for another shot at a marathon, this time with a bit of experience under my belt and some Colorado mountain trails to build up some strength. Categories: In My Head | Tags: boulder, marathon, moving, reflection, seasons, standards, training | Permalink.